Quora is the most popular question answer platform in USA, UK, Canada, Australia; with Alexa rank below 100! 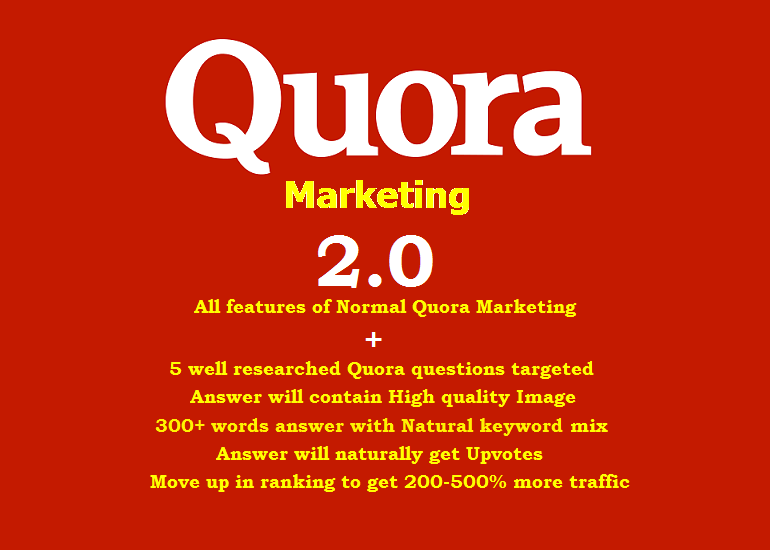 Currently Quora links are ranking on Google for more than 20 Millions Keywords. With help of this service, I will promote your website in Quora 2 times with Niche related contextual backlinks. You will get high quality traffic as well as powerful authority backlink. I will choose 2 different questions to answer. I have developed a secret technique; using that Quora backlinks will never be deleted! 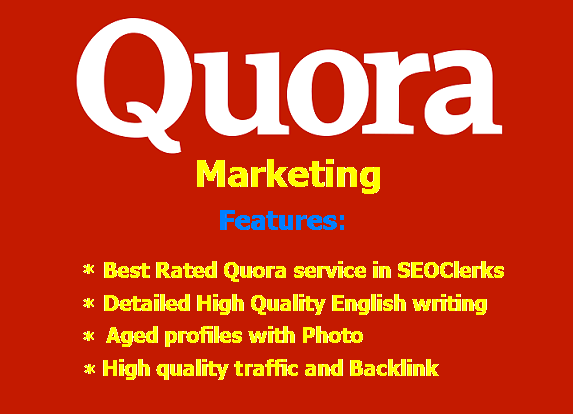 This is the Highest Rated and Most Popular Quora marketing service in SEOClerks. Quora is the Biggest Q and A social platform. Google loves Quora, Quora links often rank for high competitive keywords! PA - 92, DA 90. Good for SEO. I have Multiple Quora profiles, all Aged. It's quite simple and straight forward. First I will go through your website to understand the theme/niche, accordingly I will search for relevant question and answer with your website/blog URL. Website/Blog URL you want to promote. Delivery time is the Fastest on SEOClerks! Check out my Highest Rated Yahoo Answers service on SEOClerks. Promote your Website on QUORA with Contextual Link is ranked 5 out of 5. Based on 177 user reviews.